“I think it’s an extension of what we have done before. We launched our hedge fund benchmarks with daily tracker indices to provide a better measure of hedge fund performance while also providing insight on what the drivers of returns are,” said Rohtas Handa, EVP and Head of Institutional Solutions at MPI. 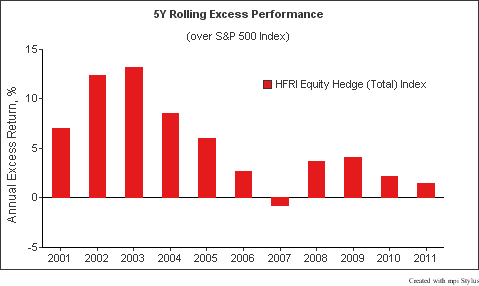 “While traditional hedge fund indices give a measure of overall performance, there isn’t a focus on what is driving constituent returns. So, we are excited to deliver these new insights.” Read the full article here. “Target volatility versions of the MPI Eurekahedge 50 Tracker Index are now available with 6% or 8% volatility, while the MPI Best 20 Tracker Index, which tracks the MPI Barclay Elite Systematic Traders Index, comes in 8% and 10% volatility versions. “You can scale up the volatility and scale up the risk level of the proxy index to get an ‘apples-to-apples’ comparison,” said Rohtas Handa, head of institutional solutions at MPI.” Read the full article here. A Hedge Fund Index – the Best Investment Ever?